(13) How many sittings/days are needed to cure a person? Depends on the condition of the patient, how much vision loss there is and on what type of loss is there as well as the degree of loss. 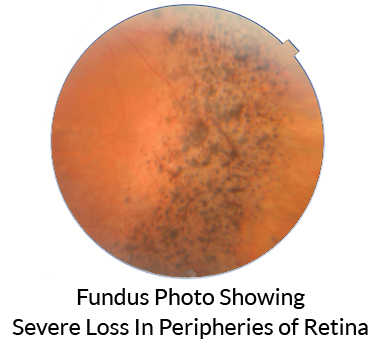 Common complications in RP are loss of central vision, loss of peripheral vision, loss of depth perception, loss of night vision,color vision deficiency , poor visual acuity and difficulty in sunlight.While in macular degeneration, loss of central vision more prominent . Before promising any improvement, we advise certain examinations to assess the condition and then promise improvement based on how much loss is there. Please note that not all types of loss are cured 100%. By experience we know how much loss can be reversed. In mild to moderate conditions, usually one course of 12 days is sufficient. For severe loss, it may require one or even two additional courses. But the second course is given only after patient is satisfied with the results from the first course and the patient himself feels that the results have lasted for a year or so. So the patient is not 100% cured in severe loss but our thrust remains to make the patient independent at least in all his activities.